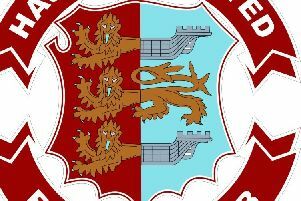 A pair of splendid goals from Youssuf Bamba earned Hastings United Football Club an eighth victory in nine league games. The left winger scored in either half as Chris Agutter’s side consolidated second place in the Bostik League South East Division with a 2-1 win at home to Three Bridges this afternoon (Saturday). Although not at their fluent best, Hastings did enough to maintain their 100 percent home league record in front of another very healthy Pilot Field crowd. Bridges spurned a presentable early chance when Jensen Grant volleyed well over from a Liam Collins cross and Hastings opened the scoring from the resulting fourth minute goal kick. Home goalkeeper Charlie Horlock played a superb ball out to Emmanuel Mensah on the right and he in turn found Sam Adams in a central position. Adams passed to Bamba on the left and he turned his way past a Bridges defender before rolling the ball home from an acute angle. Hastings’ lead, however, lasted just six minutes. Ibby Alanbi got on the end of a ball over the top through the visitors’ inside left channel and squared to Brannon O’Neill, who produced a sublime flick into the bottom corner just beyond the reach of the diving Horlock. Olumide Oluwatimilehin’s deflected shot from the right-hand side of the area was well held by Horlock low to his left, while at the other end, Bamba was denied by a crucial block from Collins following a lovely one-two between Adam Lovatt and Adams. Daniel Ajakaiye then shot wide of the near post from Sam Beale’s cross at the end of a well-worked Hastings move, while Alanbi’s angled drive went just wide of the far post for Bridges. Hastings were enjoying plenty of possession, but finding it difficult to break the opposition down. Bridges were whiskers away from taking the lead when a terrific strike by Omar Folkes from the left-hand side of the area was fingertipped onto the crossbar by Horlock. The visitors had another chance in the second minute of added time at the end of the first half, but Alanbi hooked his shot wide of the far post following a mistake in the Hastings defence. Hastings continued to see a lot of the ball without doing a great deal with it early in the second period. It needed someone to produce a moment of magic to break the deadlock and Bamba duly provided it with what turned out to be the winner in the 55th minute. Bamba picked up the ball midway inside the Bridges half, escaped the attentions of a pair of opponents and drove into the box before finding the net with a low left-footed shot. For a while after that Hastings looked more threatening and Ajakaiye’s shot on the turn was saved by the legs of Bridges goalkeeper James Shaw from Jack Dixon’s pass at the end of a slick move. From nowhere really, Bridges saw two efforts go narrowly wide in the space of three minutes, firstly O’Neill’s drive from 25 yards and then Folkes’s effort from inside the area. Moments later, Dixon’s low left-footed shot from outside the box was pushed round the post by Shaw. The closing 20 or so minutes certainly weren’t relaxed from a Hastings perspective, but the hosts got through them with no real alarms other than Horlock saving well at the feet of Alanbi following a Folkes throughball. Bridges finished the match with 10 men after midfielder Lee Hall was shown a second yellow card for a trip on Lovatt near the corner flag in the second minute of added time. A minute’s applause was held before kick-off in memory of Mark Cruttwell, the father of Hastings midfielder Sam Cruttwell who died recently at the age of 54. Mark was a popular figure at The Pilot Field and regularly helped out with jobs around the ground. Hastings: Horlock; Mensah (Fielding 88), Howlett-Mundle, Climpson, Beale; Lovatt, Ibrahim, Adams (Dixon 51); Azeez, Ajakaiye, Bamba (Christie 86). Subs not used: Golding, Ogboe. Attendance: 479. Bostik League South East Division top half (played-points): 1 Cray Wanderers 11-31 (+20 goal difference), 2 HASTINGS UNITED 9-24 (+15), 3 Hythe Town 11-22 (+7), 4 Phoenix Sports 12-21 (+5), 5 VCD Athletic 11-21 (+5), 6 Whyteleafe 9-18 (+8), 7 Horsham 10-16 (0), 8 Ramsgate 11-15 (+2), 9 Haywards Heath Town 11-15 (+2), 10 Sevenoaks Town 11-15 (0).